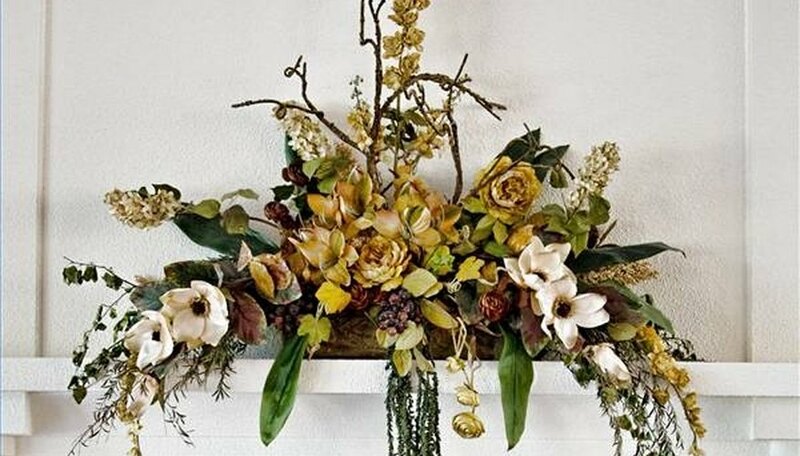 Floral swags can make any room come alive and they are said to bring luck when placed over a doorway. There are so many flowers and greens that can be used in floral arrangements that deciding which ones to use will be harder than actually making the swag. You can use dried, silk or live flowers depending on what you want to use it for. You can even use a combination of dried and live or dried and silk, both look great. Decide what size of swag you want. If you design a swag for a specific location, measure the location's width and height. For instance, you may have 12 to 18 in. between the door and the ceiling, so a swag to be 24 in. high won't fit. Check the width and decide if you want the swag to go from frame to frame, hang over the sides of the door frame or be smaller than the door frame. Choose a style to match the decor in the room where the sway will hang. You can make a swag fit into a country decor by using all dried flowers and placing a county designed ribbon in the center. A folk art style could include a small piece of wood in the center with a rooster painted on it. The contemporary look can have thin silver metal wires shooting out from the center. Pick out the colors that will match the room and the decor. Flowers, including silk flowers, come in every color of the rainbow. You will want some big flowers and some small ones. Use a craft store catalog to see what's available if this is your first arrangement. Draw your design with a pencil, then use color pencils to fill in the colors that you've chosen. See if the design and colors complement the room where it will be placed. If not, try a new drawing. Make a list of everything in your design and all the materials you'll need to put it together, such as floral wire, hot glue and a hot glue gun or maybe some floral foam. Take the list to the craft store so you won't forget anything. Or you can show your drawing to a professional if you don't want to create the floral swag yourself.